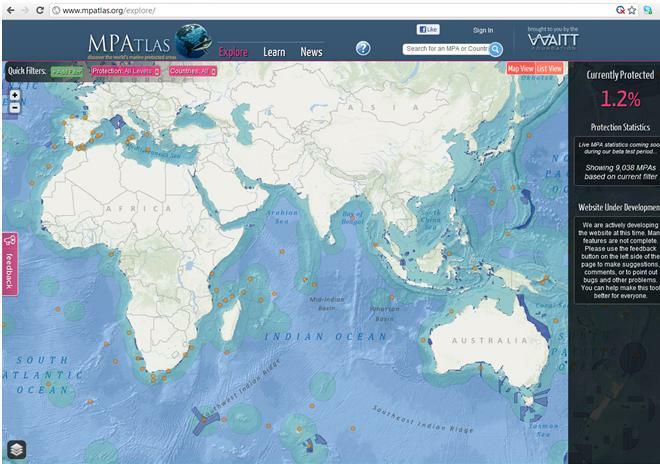 The Marine Conservation Institute, in partnership with the Waitt Foundation, has developed an online digital atlas that assembles information on marine protected areas (MPAs) around the world. This is a valuable tool that provides the ability to explore sites and characteristics of existing and proposed MPAs. When developed with careful consideration of fishing communities, MPAs have the potential to accelerate recovery of fish populations, increase ecosystem resilience and provide data for stock assessments and catch limit setting. Learning about existing MPAs and their impacts can help inform the design and implementation of future sites, and hopefully improve the ability of MPAs to provide direct ecosystem and fishery benefits. This entry was posted in Uncategorized and tagged MPAs. Bookmark the permalink. Both comments and trackbacks are currently closed.